The attractive and powerful MH Washlet+ C200 Wall Hung Toilet and Bidet System by TOTO is designed with style, comfort and convenience in mind. 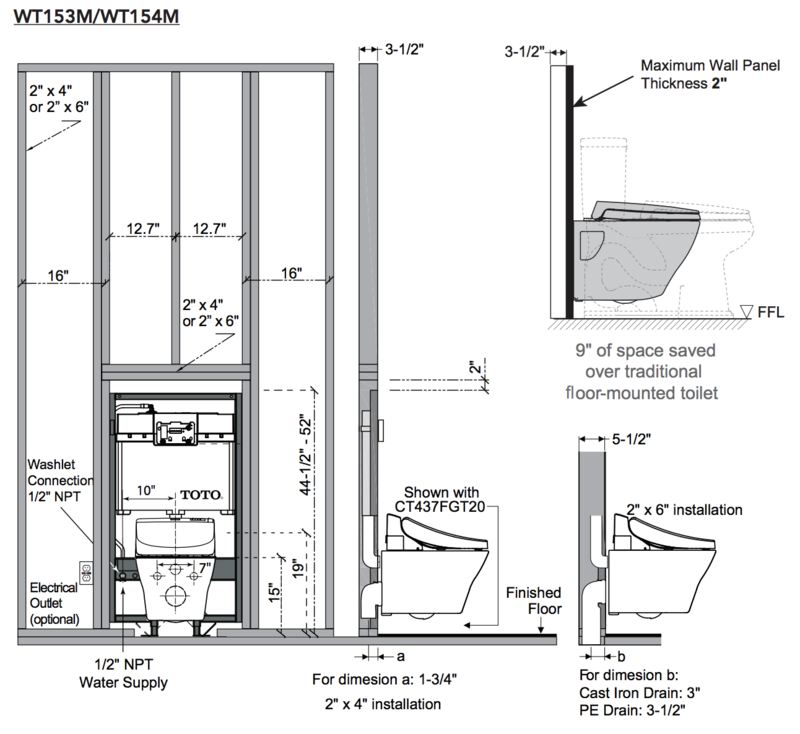 Do note that this Washlet+ system comes with a bidet seat and a toilet which have been specially designed for one another so that the cords and connections of the bidet are hidden from view. This provides a supremely sleek look, though it does mean that the C200 Washlet+ bidet seat included with the system is only compatible with the MH Washlet+ Toilet and won’t fit on other toilets. The MH Washlet+ Toilet is a wall hung unit, meaning that the flushing mechanism is hidden in the wall. This configuration not only saves up to 9 inches of space, making it a great choice for small bathrooms, its mounting height can also be personalized anywhere between 15 and 19 inches depending on your needs and preferences. The toilet itself features TOTO’s forceful 3D flush system along with an efficient dual flush mechanism that gives you the option of using 1.28 gallons per flush or 0.9 gallons per flush, depending on whether you’re flushing solid or liquid waste. In addition, TOTO’s special CeFiONtect bowl glaze and premisting feature help keep the toilet clean by making it difficult for residue to stick to the bowl. The chrome push plate flushing button has a high end look, and TOTO offers the option of upgrading to a stainless steel or glass/white push plate if chrome isn’t the right look for your bathroom. The C200 Washlet+ Bidet Seat is packed with features that will take your toileting routine to the next level. It offers three wash modes (front, rear and soft rear) along with adjustable wand position, water pressure and water temperature. Oscillating and pulsating spray options cause the spray to move from side to side or to alternate between hard and soft pressures, respectively, in order to soothe tender areas and help stimulate the bowels. In addition, both the heated seat and the warm air dryer come with adjustable temperature controls to keep your bum toasty no matter how chilly it is in your bathroom. You can say goodbye to the angst caused by unpleasant bathroom odors thanks to the seat’s automatic air deodorizer, which helps keep your bathroom smelling fresh, and two user presets enable you to program your favorite settings into the remote for a fully customized wash and dry at the touch of a button. It’s worth noting that this bidet seat utilizes a tank water heating system, meaning that it keeps a finite amount of warm wash water on hand at any given time. When the tank is depleted, the unit uses cool water for a few minutes, until the tank can refill and reheat. If this is a dealbreaker for you, you’ll want to look into a Washlet+ system that comes with an instant water heater. All in all, the MH Washlet+ C200 Wall Hung Toilet and Bidet System looks fantastic and provides all the bidet features you need to have a supremely comfortable and convenient restroom experience.